As the sun begins to shine down upon the landscape, flowers and plants emerge to light up the flower garden. Many sun-loving flowers come in a wide range of bright colors, unusual textures and varying heights. Often, sun-loving flowers are heat- and drought-tolerant. Tucked along a garden walkway or lining a flower border, full sun plants create a showy garden display. Zinnia (Zinnia elegans) is a perennial flower with a moderate growth rate and clumping growth habit. 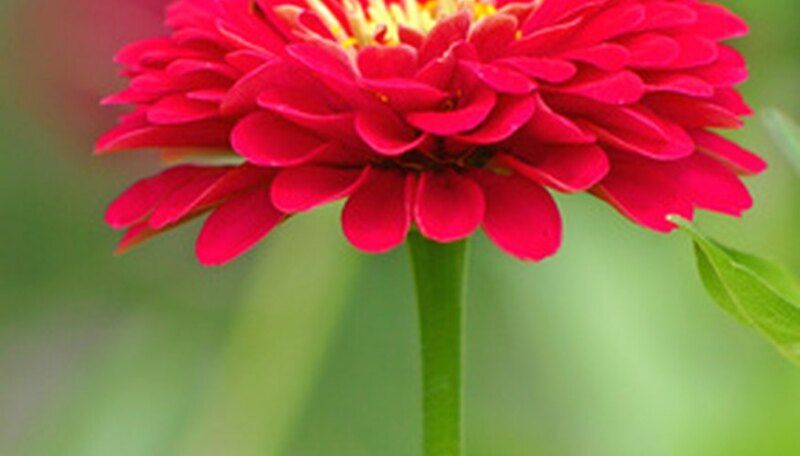 Zinnia flowers grow 1 to 3 feet tall and wide and are ideal for a cutting garden or garden border. The upright, tall and bushy stem holds the colorful blossoms that come in a wide range of colors including yellow, purple, pink, crimson and red. The blossoms on the zinnia are double, semi-double or single blooms. Drought- and deer-tolerant, zinnia flowers attract butterflies, birds and hummingbirds to the garden. Zinnia have a rapid growth rate and emerge in summer to last into the fall. The plant requires direct sun and well-drained soil that is nutrient-rich. To promote a long flowering season, deadhead the spent blooms as soon as they are noticeable. Hollyhocks (Alcea rosea) are perennial flowers that thrive in the full sun of summer. Growing 24 to 60 inches tall, hollyhocks create a commanding landscape presence. The large flowerheads on hollyhocks grow along the tall, upright stalks in a wide range of colors including yellow, pink, white, purple and apricot. Ideal for lining a back flower border for height and color, hollyhocks bloom in late spring to early summer to last into the fall. Hollyhocks also come back each year to provide a long-lasting garden addition. They require well-drained, fertile soil to thrive. The USDA Hardiness Zone for planting is 5 to 9. Apricot delight yarrow is a perennial flower that emerges in early summer to light up the landscape. The long-blooming, flat-topped flowers on apricot delight yarrow begin as a deep red to apricot color to slowly change to a pale salmon. Smaller than most typical yarrow flowers, apricot delight yarrow looks striking tucked into flower containers. The foliage on apricot delight yarrow is bright green and fern-like with a finely textured appearance. A butterfly attractant, apricot delight yarrow flowers grow 1 to 3 feet tall and wide. They can be divided after their blooming season to grow in other areas of the garden. To promote flowering on the apricot delight yarrow, deadhead the blooms as soon as they are visible. Apricot delight flower requires full sun and well-drained soil. The zone for planting is 3 to 9.